Rich in protein to keep your hunger under control up to 4 hours. Shake things up with the best tasting protein shakes ever from Slimfast. Replace one of your meals with a delicious 190 calorie or less per serving protein shake. They give you about a third of your recommended daily intake of the most essential vitamins and minerals. Rich in protein to keep your hunger under control up to four hours. Slimfast French Vanilla Protein Meal Shake contains 180 calories, 10 grams of protein and 5 grams of fiber per serving, 0 grams trans fat and no partially hydrogenated oil. Additionally, each shake contains 24 essential vitamins and minerals (about a third of your daily recommended take) and provides 50 percent of your daily recommended calcium intake. Need to drop a few lbs fast? No worries. Whatever the reason, Slimfast is here to help you get what you really want. By swapping two meals per day for delicious Slimfast protein meal bars or shakes, you can lose up to six pounds in the first two weeks. Now, how easy is that? Need a couple of ideas for a nutritious third meal? We can help! 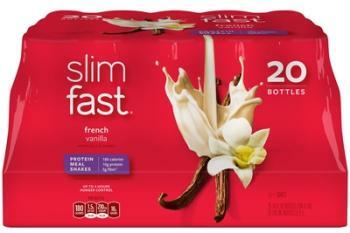 Slimfast has many delicious 500 calorie recipes at Slimfast. com, come check us out and get what you really want. And after 14 days, vavavoom! Get into the mix. Shake up your routine with a variety of flavors that are ready to enjoy in seconds. Simply combine with eight fl. oz. of fat free milk to create your own deliciously satisfying shake. Loaded with 10-15g of protein and four to five grams of fiber per serving to keep you satisfied for up to four hours. Nosh on these delish delights. Treat yourself to super yummy Slimfast Snack Bars. From Double-Dutch Chocolate to Peanut Butter Crunch Time flavors, you’re sure to find a new favorite. Raise the bar on the go. Whether you crave decadent rich chocolate or sweet and salty, we’ve got a flavor for you. Loaded with eight to ten grams of protein and six to nine grams of fiber per serving to keep you satisfied for up to four hours. *If you want to lose weight & are under 18, pregnant, nursing, following a diet recommended by a doctor, have health problems such as diabetes, or want to lose more than 30 lbs., see a doctor before starting this or any diet. Do not lose more than 2 pounds a week after the first 2 weeks. Rapid weight loss may cause health problems. Do not use as a sole source of nutrition. Follow the Slimfast plan based on 1,200 calories per day. Drink plenty of water, and exercise 30 minutes daily. Shake it up. Satisfy your sweet tooth with irresistible Slimfast Protein Meal Shakes in flavors from Creamy Milk Chocolate to Strawberries ‘n’ Cream. It gets even better–they fit perfectly in your purse. Loaded with 10-20g of protein and one to five grams of fiber per serving to keep you satisfied for up to four hours. Drink to that.